What are the rules of the road when interacting with people in the blogosphere? Chances are, if you are already a blogger, you have probably already worked out your own method of contacting and interacting with other bloggers. There is a rapidly emerging informal code of conduct in the blogosphere - though it varies from person to person. Some bloggers state on their blogs how they would like to be contacted and how they expect others to interact on their blogs. 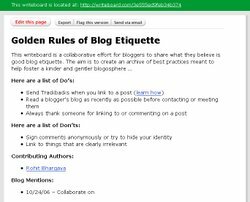 Others shun such rules, instead choosing to take over control on their blog by limiting or removing comments, or instituting a manual approval process for user contributed feedback. Either way, it can be very confusing for anyone to know the right way to conduct themselves on blogs. In part, this confusion is leading to an increasingly common blog-specific attitude ... snarkiness. Unfortunately, snarkiness is getting more attention. Rohit - great idea! I've been using BackPack, one of Writeboard's applications for a while and I love it. Thank you for taking the initiative on putting together the definitive guide for bloggers.